Work in progress. So far so good. Which gives me an idea for this week's Eye Spy theme...A Work In Progress. Don't forget to head over to Cindy's and add your name so we can see a WIP at your place. I want to move into your house. Looks gorgeous. Looking good! I am now thinking of putting the skylight back on the top of our list. They rarely got 'the light factor' right 100 years ago and a skylight is a fairly unobtrusive way to let it shine on in for older places....you will wonder why you waited so long.....just look at that gorgeous Autumn light pouring in! Our friends had the same problem in the kitchen of their Queenslander. They have done a beautiful job of bringing the home back up to scratch - repolishing the floor boards, painting, new stumps, new gardens etc - but you just couldn't be in the kitchen at any time of the day without a light on. So skylight is was. They are really happy with it. You'll love it Michelle - promise!! This looks great - so much light. 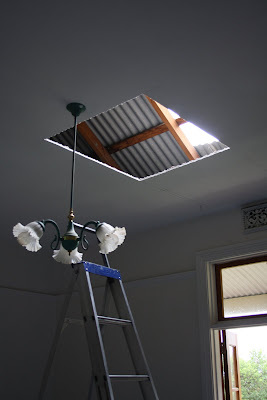 Is this a loft or a sky light - I should read the next post to find out. so are you enjoying the happy light?